Flightless feathered family. The cassowary is a large, flightless bird most closely related to the emu. Although the emu is taller, the cassowary is the heaviest bird in Australia and the second heaviest in the world after its cousin, the ostrich. It is covered in dense, two-quilled black feathers that, from a distance, look like hair. These feathers are not designed for flight but for protection in the cassowary's rain forest habitat, keeping the bird dry and safe from the sharp thorns found on many rain forest plants. Long, strong bare quills hang from the bird's tiny wings. Cassowaries are generally jet black as adults, but the fabulous skin colors on their face and neck vary according to species and location. Female cassowaries are larger than the males and are even more brightly colored. Wild headgear! All three cassowary species have a casque, also called a helmet, that starts to develop on top of their head at one to two years of age. The casque is made of a sponge-like material and covered with a thick layer of keratin, the same thing our fingernails are made of. Although it is quite sturdy, the casque can be squeezed in the middle fairly easily. No one knows for certain why cassowaries have a casque. It could reveal a bird’s age or dominance, or be used as a sort of helmet or shock absorber that protects the bird's head as it pushes through the rain forest underbrush. The casque could also work much like a hornbill’s casque does in helping the bird make sounds. We know that both the southern and dwarf cassowary can produce very low frequency sounds, called booms, that help them communicate through the dense rain forest, so perhaps the casque helps with that in some way. Females tend to have a larger casque than males. Cassowaries also hiss and whistle to communicate, and clap their bills or rumble when making a threat. The rumble is so low and powerful that keepers working with the birds report they can feel it in their bones. Wonderful wattles. Two of the three cassowary species have wattles, or bare, fleshy pouches of skin that hang from the neck: southern or double-wattled cassowaries and northern or single-wattled cassowaries. The wattles are brightly colored blue, red, gold, purple, or white, depending on the species or subspecies. Their purpose? Perhaps to help indicate the bird’s mood or relay other social cues known only to the cassowaries. Crepuscular creatures. Cassowaries are extremely difficult to observe and study in the wild, as they are quick to retreat in their thick rain forest home, so little is known about their natural behaviors. They seem to be most active at dawn and dusk (called crepuscular behavior), when they search for food, resting in a spot of sun during the day. What a kick. The cassowary is rightfully considered the most dangerous bird in the world! Each 3-toed foot has a dagger-like claw on the inner toe that is up to 4 inches (10 centimeters) long! The cassowary can slice open any predator or potential threat with a single swift kick. Powerful legs help the cassowary run up to 31 miles per hour (50 kilometers per hour) through the dense forest underbrush. A cassowary can also jump nearly 7 feet (2 meters) straight up into the air and swim like a champ, so the bird is quite good at fending off threats or escaping danger! That long claw also comes in handy when digging for fallen fruit in the leaf litter. Who is who? Of the three cassowary species, the southern or double-wattled cassowary is the largest and probably most well known. It lives in the New Guinea lowland rain forests and is slightly less common in northern Queensland, Australia. Its casque is bladelike and brownish, and the head, neck, and throat are featherless so bright blue skin can be seen. Dutch traders first brought this species from New Guinea to Europe in 1597. A bit smaller than its southern cousin, the northern or single-wattled cassowary is the most recent to be discovered by scientists (in 1860) and is probably the most threatened of the three species. It is found only along the banks or rivers and coastal swampy lowlands of New Guinea. 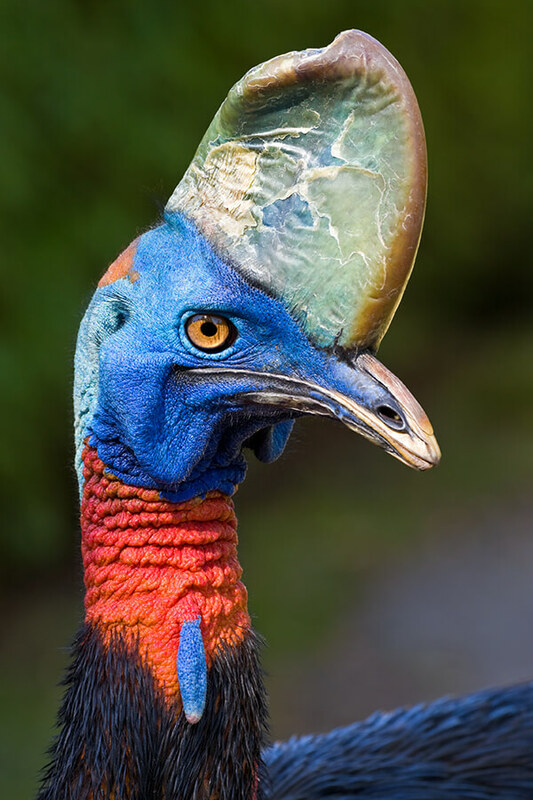 Its casque is larger and more flared than the southern cassowary’s, and the throat skin and wattle are either red or golden, depending on where the cassowary is found. The smallest and most colorful of the cassowaries, the dwarf cassowary is the only one without wattles. Instead, it has a round, purple spot where the wattles would be and bright pink spots on its cheeks. The dwarf cassowary's casque is black, triangular in shape, and is flattened at the back. The head and face are black, the neck is deep blue, and the shoulders are red or violet. This bird lives in the higher elevations of New Guinea, leaving the lowland rain forests to its larger cousins. It is common in New Guinea but is rarely seen in zoos. These fascinating birds range across Northern Australia, New Guinea, and surrounding islands. They live in tropical forests and wetlands. Cassowaries are frugivores that feed on the fruits of several hundred rain forest plants. Because their digestive tract is relatively short, their droppings contain fruit seeds that are only partially digested. Sometimes these seeds are so large that no other animal can swallow them! One test showed that seeds from a rare Australian rain forest tree, Ryparosa sp., were much more likely to sprout after passing through a cassowary’s digestive tract than those that simply fell to the ground on their own. In fact, many plant species require passage through the cassowary's digestive system to be able to sprout! Leave me alone. Cassowaries are solitary most of the year, living in loosely defined home ranges. If two males meet accidentally, they stretch, fluff up their feathers, and rumble at each other until one decides to leave. But if a male meets a female, she can usually make him run merely by stretching a little and staring quietly! Breeding season coincides with the time of year when fruit is most abundant in the bird's rain forest home: June to October. The solitary female becomes more tolerant of adult males as breeding season approaches. The male struts in a circle around the female and calls to her in a series of low booms. The pair stays together for a few weeks until the female is ready to lay eggs, and they find a nesting site made of a simple scrape in the ground and a few leaves. Once the female lays her three to five eggs, which are green, she moves on, leaving the male to incubate the eggs and look after the hatchlings. Like the female emu, she may find and breed with another male and lay another clutch of eggs. Daddy day care. A male sits on his nest to incubate the eggs for up to 60 days. Once the brown-and-tan striped chicks hatch, he leads them to his regular feeding grounds, protecting them and teaching them the ways of the world. Youngsters stay with their father for up to 16 months, but usually 9 to 10 months, when he chases them off to live on their own so he can get ready to breed again. By this time, they are almost adult size and can certainly take care of themselves! The San Diego Zoo had cassowaries in its earliest years, the 1920s. A male named Cassy arrived with a large shipment of animals from Australia in 1925. A southern or double-wattled cassowary, the young bird was allowed free reign at the fledgling Zoo, greeting visitors at the entrance or roaming the Zoo’s grounds at will, often coming up to a guest and helping himself to a bunch of grapes or a bite of sandwich! When the Zoo received a pair of southern cassowaries in 1929, a proper enclosure was built for them. They, too, were so tame they would come to the fence to be petted. Our first dwarf cassowaries arrived in 1940 and our first northern or single-wattled cassowaries in 1941. Cassowaries are rarely hatched in zoos and are difficult to rear. In 1862 and 1863, the London Zoo reported single hatchings, but neither chick survived. It was not until April 1957 that the first successful rearing of a cassowary chick in managed care was reported—at the San Diego Zoo. The baby’s father had lived here for 31 years before the successful hatch! His offspring lived for 15 years. Only one other cassowary chick has been hatched here; sadly, it only survived one day. Guests will be able to see these unusual birds in the new Walkabout Australia experience at the Safari Park. Wealthy European collectors sought cassowaries for display in private menageries in the 16th and 17th centuries. 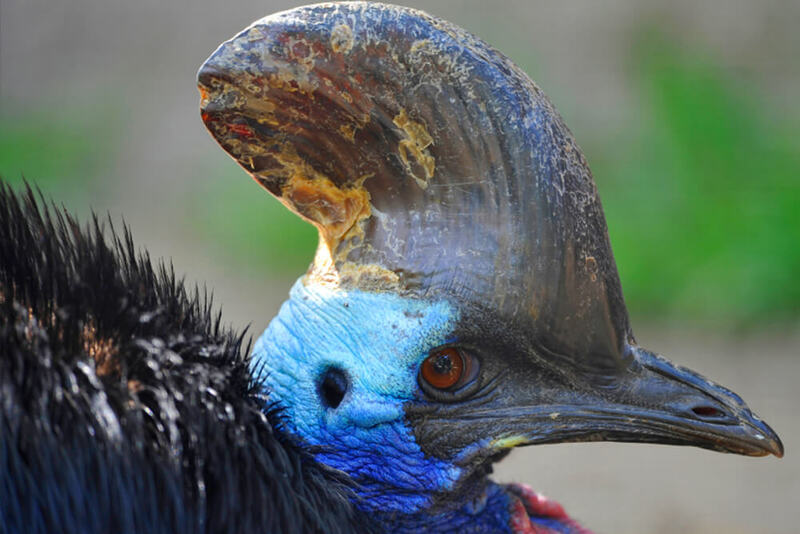 Even today, native peoples use cassowary feathers for ceremonial headdresses. Young birds are often kept and sold for meat when they get large enough or used as dowries. There are now fewer southern cassowaries in Australia than there are giant pandas in China. Although none of the three cassowary species are considered globally threatened, all are suffering from loss of habitat. Much of the Australian rain forest where the southern cassowary is found has now been cleared, and the birds that remain face threats from dogs, feral pigs, hunters, traffic when crossing roads, starvation, and diseases. Hunting and the clearing of forests for farmland affect cassowaries living in New Guinea and its surrounding islands. Nonprofit organizations in Australia are working to plant rain forest trees in an effort to restore habitat and food sources for cassowaries. 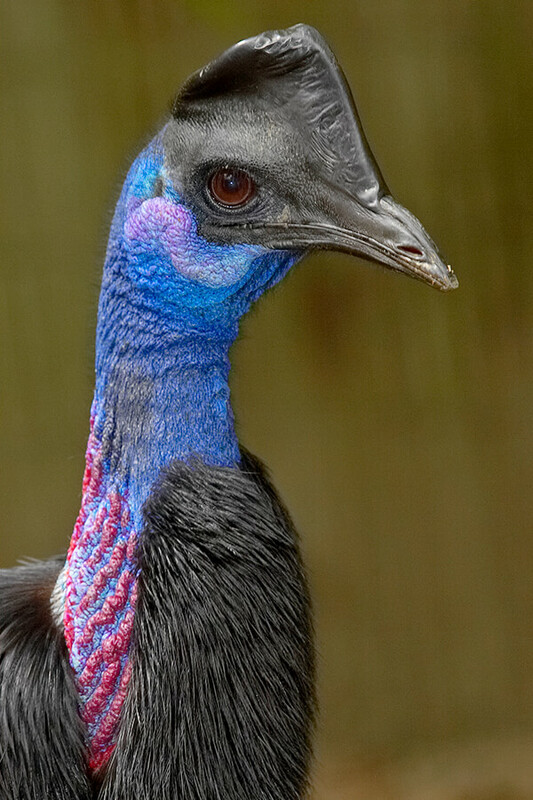 Many zoos participate in a Species Survival Plan (SSP) for southern cassowaries; its North American Regional Studbook is held at the San Diego Zoo. In addition, San Diego Zoo Global is helping to support a study to place radio collars on juvenile cassowaries that are rescued and released after being hand raised to see if tracking is feasible. This would allow researchers to follow their activities and determine if the reintroduction is successful. Largest: Southern cassowary is 4 to 5.6 feet (1.2 to 1.7 meters) tall; females weigh up to 167 pounds (76 kilograms) and males weigh up to 121 pounds (55 kilograms). The booming sound a cassowary makes is the lowest known call of any bird and is right at the edge of human hearing. The name cassowary seems to be of Papuan origin. “Kasu” means horned, and “weri” means head, referring to the bird’s casqued or helmeted head. Some people in New Guinea believe that cassowaries are reincarnations of female ancestors, while others believe that the cassowary was the first mother. The first cassowary arrived in Europe in 1597 for the collection of Emperor Rudolf II.